In the earliest days of cars, garages were not much of a priority for homeowners. Horse drawn carriages were popular and only the wealthiest individuals had the means to own a car. Even so, cars were more of a luxury item than anything else and, as a result, the storage of cars was in a very primitive stage. In many cases, cars were stored in any available sheds or barns that had enough room to accommodate them and nobody spent recreational time in those areas. While you could say that the concept of “the garage” was born, these were very basic times. Starting around the 1920’s, the garage began to take its place as one of the primary features of homes. The growth of the auto industry made it possible for the average American to own a car and an increasing number of homeowners expected to have a garage included in their homes. By the end of the second World War, overhead garage doors and garage door openers were widely used. This was around the same time that the garage became a popular workplace, and garage rock bands gained prominence by the 1960s. The garage had clearly evolved and was no longer an afterthought in the construction of a house. In modern times, garages have become quite diverse. With electricity, advanced heating, air conditioning systems, and many other present-day conveniences, garages can be used for almost anything. 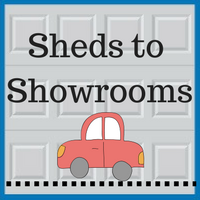 Whether you have converted it into a family room, use it as a personal office, or have turned it into your own personal showroom, the modern garage has come a long way. If you find yourself in need of assistance while working in your garage, please contact our garage experts at Blue Sky Builders today by calling 630-852-8485. To read more information about garages from your favorite garage experts, visit us online at www.blueskybuilders.com.